The Reds will need to produce a big performance against Napoli at Anfield to progress to the last 16. Klopp and Liverpool were left frustrated in Paris. 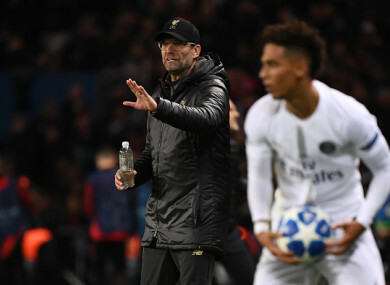 LIVERPOOL MANAGER JURGEN Klopp said his team “looked like butchers” because of the reactions of the Paris Saint-Germain players to challenges during the French team’s 2-1 Champions League win on Wednesday. A “little hurdle we had to overcome was the 500,000 disruptions in the second half and the referee still thinks he did everything right,” the German said. “We are one of the fairest teams in England but tonight we looked like butchers,” he added. Juan Bernat and Neymar scored to put PSG in control in the first half in the French capital, but a James Milner penalty on the stroke of half-time ensured the pivotal group game remained in the balance until the death. Liverpool — beaten in each of their past five games away from Anfield in the Champions League — now face the real prospect of missing out on the knockout stages just six months after reaching the final against Real Madrid. Napoli beat Red Star Belgrade 3-1 on Wednesday and Liverpool will have to win by two clear goals or 1-0 at home to the Italians in a fortnight to ensure they progress. “The start was like what we expected, it was very wild and intense and they took all the risks,” Klopp told BT Sport. They scored twice by winning the second ball. We still had to stay in the game, but as soon as we had a bit of control, you saw the game wasn’t decided. Captain Jordan Henderson said Liverpool can keep their Champions League destiny in their own hands by beating Napoli. “We are disappointed because we think we are good enough to come here and win,” he said. “We now have another big game at Anfield and we can get through that and into the next round,” he added. Email “Liverpool made to look 'like butchers' by PSG, says Klopp”. Feedback on “Liverpool made to look 'like butchers' by PSG, says Klopp”.